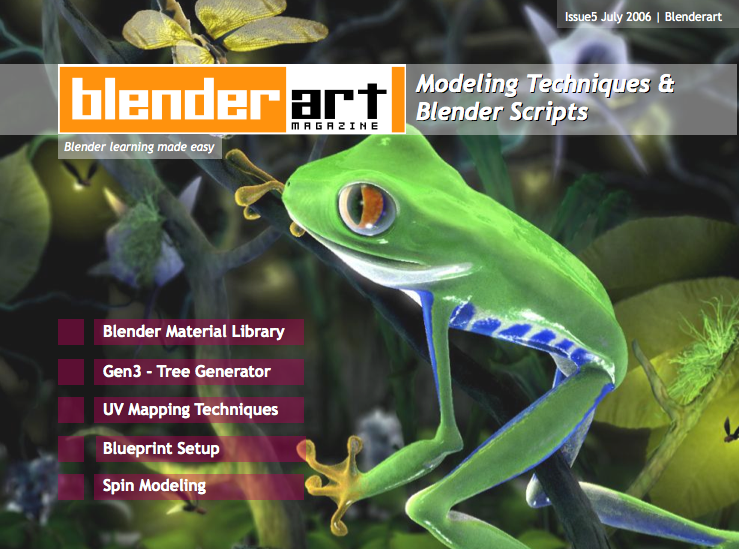 BlenderArt Magazine is the free periodic Blender Magazine that covers one or two specific themes in each issue. This issue's theme is Modeling Techniques and Python Scripts. If you're looking for character-, low-poly- o treemodeling tutorials, be sure to check it out! 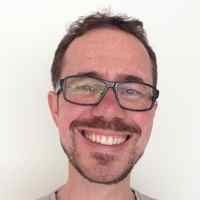 Welcome to Issue #5, Modeling Techniques and Python Scripts. In this issue we have focused on different methods of modeling, trying to explain why any given method is used, as well as some insightful articles on python scripts, UV mapping and how to set up blueprints for use in blender. Setting up blue prints in Blender. I must say that Sandra and her team are really building up an outstanding collection of high-quality tutorials here. The downside of publishing them in one PDF though is that the individual tutorials will be harder to find for Blender users. I'd think that making the tutorials available either as webpages or as individual PDFs (say, after the issue has been out for two months) could benefit many users. The only critique I want to give the team is that the quality of some of the artwork in the Galleria section is really low. It should be quality over quantity, guys! Dunno what to say other than great efford and great reading. It's a great mag and a great contribution to the Blender community. I really enjoy this mixture of OpenSource-News, Blender-News, Tutorials and Techniques. I agree with bart about the quality of the artwork section, sometimes less is more. P.S. I never heard of 'Artweaver' before - just downloaded it and it looks like a good alternative to the Windows ports of GIMP. Well, it's bigger, it's better, it's a whopping 79 pages long! Personal Favourite (or favorite)? 'Urchopia' by Ramon cerrols. I don't know, I just seem to like buildings that seem high up and in perilous positions. I was also interested how the innocent looking photos of Rupert the vaguely cute monkey were turned into an evil looking monkey, although with a bit of editing on the supplied .blend file it didn't take much to stop him looking so... mad. Anyway, overall, it's huge, looks interesting and certainly a contribution to the community well worth congratulating. Thanks very much to all who Release this Great "Blender Art Magazine"! We can learn alot from this...very Helpfull!!! I've been downloading all Blender Art Magazines since the number one. I think they are reaching the main proposal of this important work. By the way, we have many high quality galleries in the net to stock them. Let Blender Magazine members work in their best. When they suppose to gave a pictures gallery is just to give something to enjoy the community no to make posters. Sorry its just my oppinion. About the breakdown of tutorials in small files I agree with Bart. It's like creative fuel that keeps us running. bart: "The only critique I want to give the team is that the quality of some of the artwork in the Galleria section is really low. It should be quality over quantity, guys!" Otherwise, another great issue. Thanks to the publishers and contributors! Thanks again to everyone at the magazine for another amazing issue. These tutorials are really helpful and give others the impetus to try things that they normally wouldn't. I too think the idea of seperate tuts in HTML using old articles is a great idea. is it me or the images shown in the art gallery got low? Im not a great modeller, but i think if they want to show a good work made with blender, they should publish works better than the last issues, dont you think? Sorry about the autors of the images.. The thing is that we have art submitted to us. And usually, whatever comes in is what we put in the magazine. I don't know if Gaurav (blenderart editor) actively seeks them out, so we need more people submitting us their best work. If you guys have some high quality artwork, then please submit them to us and help us build a better magazine for everyone. We're going to be calling for content soon, so when we do, just submit some cool stuff!! I would be happy to discuss breaking the tutorials into into individual files. We will have to decide how and where to upload them, perhaps the wiki book would be a good place. Something we will have to look into. As for the artwork, nam is right, we include all submissions at this point into the current issue. Perhaps we should look into having the perment staff vote on the best images submitted and only those go in. As usual, every issue we do try and improve our look and message. I do find it reassuring that this issue there haven't been alot of comments about typos :P Which up to date has been our biggest problem. I agree I put up all artwork that comes to the magazine, that is for various reasons, first I do not wish to dishearten any newbie, IMHO having a image posted some where, where it is visible to lots of eyes can make it more encouraging for the newbie artist. Remember It's not about competition here. Secondly putting all sort of images kinda shows the range of thoughts that goes behind making an artwork, considering the variety of Blender users it is interesting in its own way, but again thats my personal thought. So personally I do not think it in terms of low quality or quality vs quantity, remember my main intent of magazine was not to show off, rather help new users with good quality learning material. So its have been same with the current issue. Given that now a days we are getting quite a lot of gallery submissions, and on the other hand the magazine is getting quite popular, I was already thinking of having a mechanism to filter out outstanding works. So yeah we will be cutting down on the number of images possibly from the next issue. I agree with Gaurav, I think that newbies also deserve to have there works shown, and is a pdf magazine, so why not have a bunch of images, if someone does'nt want to see teorical "bad work" just need to skip the last pages. I think I speek for everyone when I say that everyone did is best with the knowlodge and the tools that they had avaible at the creation time. I hope have many artworker join it! well sad Rogper! I agree with you. Thank you all who contributed to this great mag. I hardly waiting every issue...! Thanx a lot! why not a top10 of images selected by the permanent staff and then all the other images in a random order, that way I think that everyone would be happy and would give artists motivation to try to be the nunber1, the man (or women)of the issue, the best of the best... therefore rising the avarege image quality level sky high. well isn't that cool? That issue rocks! Thank you Sandra for adding the lowpoly tut! :) We aim to please! Glad you liked the tutorial. While I understand it would maybe be asking a lot, I personally would like to see tutorials for complete beginners, who have never even touched a 3D programme before and something for more advanced users.